Here again I am breaking with my tradition and having chicken on Tuesday instead of Monday. It is always my intention to wash the sheets and make chicken on Monday but life often interferes. Given the success of last week’s chicken, we tried glazing the chicken breasts with BBQ sauce again. Same good result! John pan-roasted the chicken by cooking it on the stovetop part of the way, then basting it with the BBQ sauce, and finally roasting it in the oven for 5 minutes at 250F. 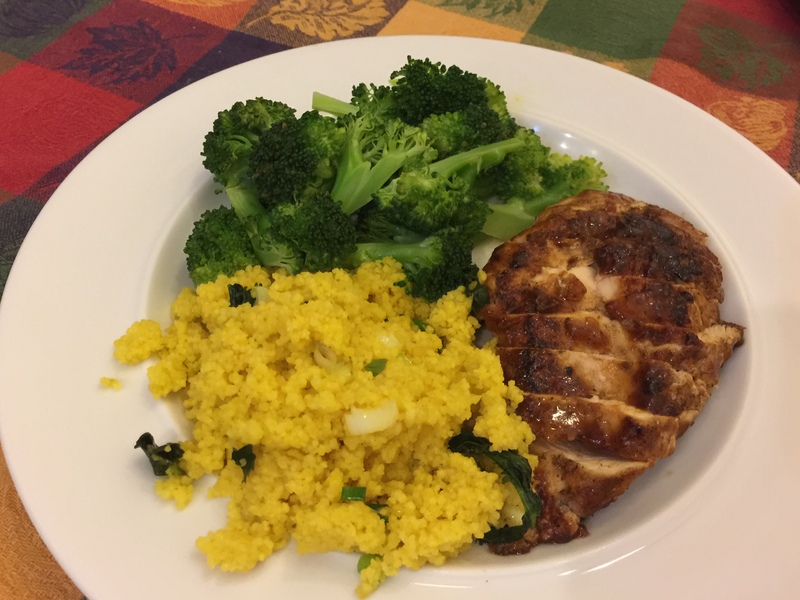 Once the chicken went into the oven I quickly steamed the broccoli, and made the couscous. For the couscous I sautéed 2 cloves of garlic with some turmeric and lemon zest, then added 1 1/3 cups water, 1/2 teaspoon kosher salt, and 1 cup of couscous, next took it off the heat, and let it sit for 5 minutes. Before fluffing it up I added 1/4 cup cilantro and 2 tablespoons of lemon juice, plus a sliced green onion. It required more salt in the final seasoning. This entry was posted in Poultry, Vegetables and tagged broccoli, chicken, chicken dinner, couscous, Vegetables. Bookmark the permalink.